I arrived home from a business trip to Florida like I had so many times before. My corporate job kept me busy, traveling, and kept me very distracted. I walked up the busy terminal and through security at the Phoenix airport and on the other side was my husband and my baby girl with red roses in hand. If I close my eyes I can still see them both run towards me, hug me, and tell me they missed me. My husband kissed me and told me how proud he was of me – he was always my biggest cheerleader in life. For nearly the entire year of 2009 my intuition told me something was wrong, my heart seemed sad, and yet I was unsure why I was feeling that way. Life was beautiful in my world and there was really no reason to be low. I had a wonderful job, a devoted husband, and 2 healthy kids. What more could I possibly want or need? We drove home and most of the ride seemed to pass in slow motion. We made small talk about work and our kiddos until we arrived home nearly an hour later. I put our little ones to bed and looked at the clock, it was around 9pm and I had a 5am workout scheduled so I decided to turn in early. Ironically I had a funny feeling deep inside my gut that told me to hang with Mitch. It was like my heart was telling me to stay up and cuddle with him, but I fought the urge and I went to bed. He crawled into bed an hour or two later and I still remember him telling me that he loved me as he turned to go to sleep. I told him I loved him too and that was that. I’m not sure if I had a deep sense of foreshadowing or not but I sensed so much was wrong. My many gut feelings would come like warnings, moments of intuition, and often I could hear in my voice that I needed to let all the little stuff go and just be happy. We slept not knowing it was our last night. We slept not knowing we should stay up and hold each other, value our time, remember what really mattered. We slept not knowing that less than 12 hours later he would be gone from our lives forever. Life is unpredictable, life is often cruel, life can turn without a seconds notice. All those feelings, intuitions, mental photographs were my chance to slow down and appreciate what I had while I had it. I didn’t listen, I didn’t know better. So much we take for granted each day. We take for granted the smile of those we love, the laughter over silly things, a kiss, a hand hold, a loving look. Once you experience deep loss you know to value those things, you know to slow down and take it all in while you can. Before loss, we often run around valuing all the things that don’t really matter. We value things like our car, a big home, or designer clothing. We work hard to impress people who don’t really know us and wouldn’t cross the street to help us in a time of need. I can assure those things mean NOTHING to me or my children post loss. When Mitch died I never thought twice about what we owned or what he ever bought me, or who it impressed. I only remember how he loved me and the memories we created together as a couple and as a family. Memories sustain me and have allowed me many moments of deep reflection, perspective, and peace. Let all the little things go. Because all the rest is just fluff. Tonight may not be your last night, but just in case, LIVE like it is. 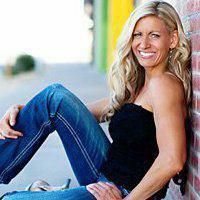 Michelle Steinke-Baumgard is a author, international speaker, fitness coach, mother and a re-married widow. After losing her husband Mitch in 2009 she turned to exercise as an outlet for grief and a way to handle stress. Michelle found it so powerful that she eventually quit her corporate job to become a fitness trainer. Since then Michelle has been featured in Fitness Magazine, Shape Magazine, contributed to articles for Prevention Magazine, The Huffington Post, and countless other media outlets. In addition to her virtual training business, and many speaking engagements, Michelle recently launched her own nonprofit focused on helping widows and widowers complete bucket list dreams to honor their late spouse while moving boldly into their future. If you know a widow who might deserve sponsorship please have them apply on this page. You can find out more about Michelle’s training programs at: 1fw Training and or One Fit Widow for nonprofit information.